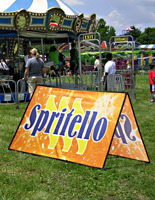 Banner Size: 58" x 29"
Completely customizable banner sign comes with digital printing for vivid advertisements. Weatherproof mesh polyester can be used in moderately wet weather conditions. A-frame design completely folds up to fit into convenient carrying case. Metal stakes included to secure banner into ground when used outdoors. Submit multiple designs per order of 10 units! Add Design Services $58.31 Checking this box will add 1 hour of design time to your order. Design time over 1 hour will require additional charges. A Designer will contact you within 1 business day to start the design process. 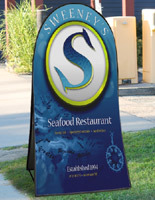 This custom pop up banner is an excellent way to convey a brand, logo or message towards a large group. This sign tent is designed for outdoor use and quickly sets up. 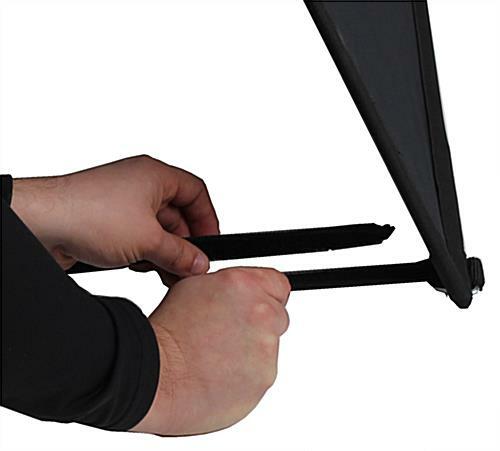 Simply remove this fabric pop up banner from the carrying case and it will fold out on its own. Connect the included hook and loop distancing straps and insert the metal stakes to ensure the display stays grounded. 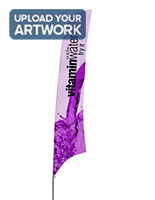 Get custom artwork printed on this 59" x 29" pop up banner. This display comes with digital printing in full color, so customers can design completely original advertisements. 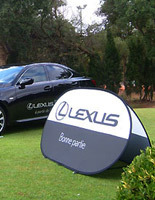 This collapsible pop up banner makes a great advertising tool for car dealerships, conventions and sporting events. 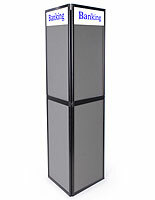 The included carrying case makes set up and transportation of these stands an easy task. 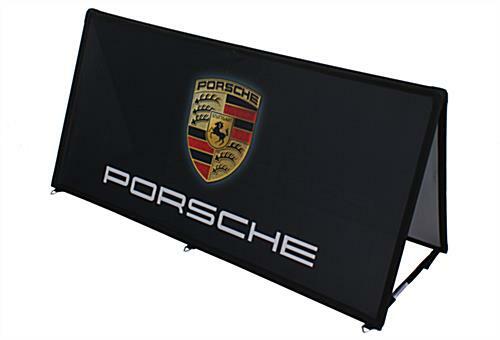 Wherever it is used, this pop up banner sign will be highly visible, helping promote a company's product or brand. This signage can also be utilized indoors! When this pop up banner a-frame is used indoors, there's no need for the metal stakes to be used. Weigh the stand down with filled water or sand bags when used indoors. 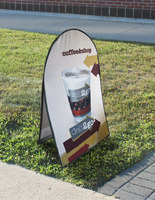 The mesh fabric of this 59" x 29" pop up banner is lightweight, making this stand easy to carry. Two shoulder straps make this sign tent convenient and help avoid some of the cumbersome qualities found with other stands. 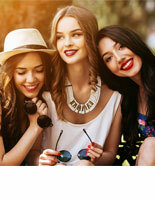 This outdoor pop up banner can be used at trade shows and exhibits too! Carry this stand and quickly set up to promote your brand! This custom pop up banner sign has hook and loop straps to keep it upright. Packing this stand up is as easy as putting it together. 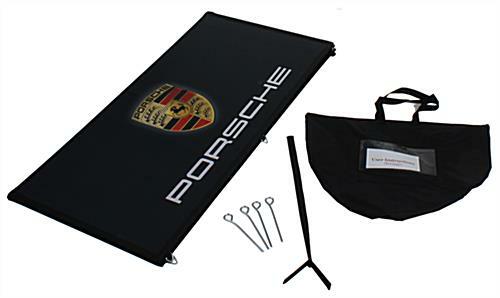 Fold this collapsible pop up banner and re-insert into the carrying case. As a default, all the banners in your order have the same artwork. It is possible to order multiple banners with different artwork, as well as banners with varying artwork on the front & back. Additional artwork review charges will apply. 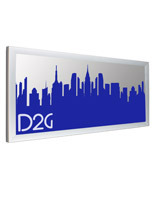 Please contact Displays2Go at 1-855-868-7003 for more information. You may also simply submit separate orders with different artwork (however, minimum order quantities do apply for each order). 58.0" x 28.8" x 19.5"
30.5" x 23.5" x 1.0"
An in-stock lead time of 16 business day(s) begins after the artwork proof has been approved. Product does NOT ship on a same day basis.